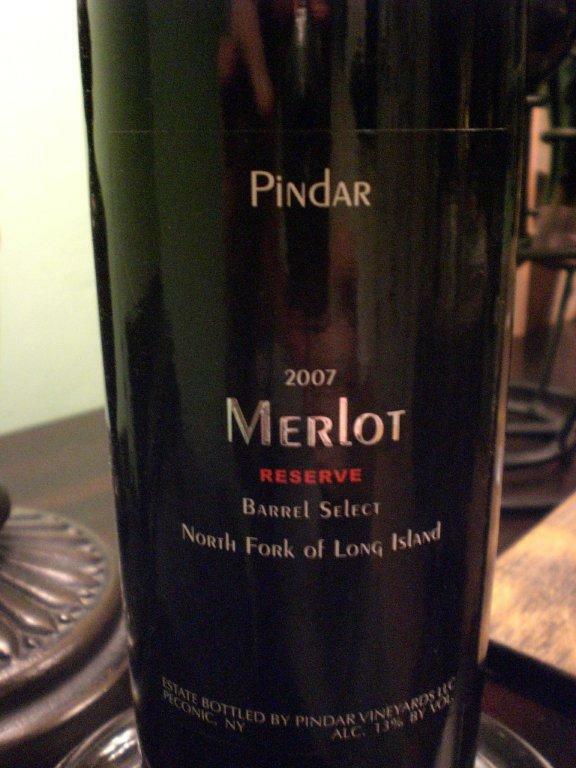 This is part 2 of a 2 part post on my visit to Pindar Vineyards. You can see the first part here. Melissa, Pindar, Les and myself walked in and the tasting room was busy…lots of business and people…very nice to see. We started off with some of their whites. We tasted through their 2008 Voignier, 2008 Sunflower Chardonnay, 2008 Sauvignon Blanc and their 2007 Johannesburg Riesling. All of these releases except for the Riesling are the work of Les Howard. Les joined Pindar in the middle of 2007 so he had a hand in the blending of some of the wines but the 2008 are all his and Pindar’s. Moreover, you can taste it in the bottle. The Viognier was a wonderful wine. Many great flavors. My tongue was dancing! This wine got better as it was coming to room temperature. If you serve this chilled, then you will lose all of the wonderful floral elements and great balance this wine brings. Just off chill is perfect. One of my favorite wines at Pindar and on Long Island. They only made 180 cases of this, so if you see it grab a bottle. It retails for $24.99. The 2008 Sunflower Chardonnay was also a hit. It was fermented in 100% new barrel oak. It really had great flavors of pineapple and a touch of vanilla. It was not over oaked. There was nice balance and the right amount of acidity. I really enjoyed this wine and I am not a barrel fermented Chardonnay guy. It retails for $18.99, and at under $20, a great value for a barrel fermented Chardonnay. I also enjoyed Pindar’s Sauvignon Blanc. I have to say, that it takes alot for me to get into Sauvignon Blanc. It is probably the one wine I tend to overlook and not taste when at a vineyard. I usually go for the Rose’s first then into the reds…maybe a Chardonnay here and there. But this wine may have changed my mind on how I look at Sauvignon Blanc. There were alot of citrus flavors, some wonderful lime flavors happening in this wine. What I loved about this was the finish. It was peaking at the middle palate and finished off nicely with intriguing green herbal finish. It really carried for a while. This was is a wine that retails for $12.99 and is worth alot more than that. Get this Sauvignon Blanc…you will not be disappointed. We then tasted Pindar’s 2007 Johannisberg Riesling. This is a semi dry Riesling. It had great between the acidity and the sweetness. I am slowly becoming a fan of Riesling, and at a retail of $16.99 this is a must have for anyone who is exploring the wonderful world of Riesling. You can also check out a further review of this wine here. Les and Pindar then moved me into their reds. They had prepared for the 2007 red tastings by having the bottles open for a while. But while we were waiting, Dr. Dan, founder of Pindar, came over and chatted with us for a while. Dr. Dan was very excited to meet Melissa and I and was very happy to hear the good thoughts I had about his wines, the tasting we had from the barrel and the experience of talking with Pindar & Les. He gave me some good advice, and loved the name of the blog, considering I was bringing my real job into my hobby. The first round was a vertical of Cabernet Franc. We tasted their current release of their 2006 Cabernet Franc. It retails for $18.99 in the tasting room. I really liked this Franc. I was getting some earthy notes on the nose, but I quickly picked up some Cherry and blackberries. There was nice balance in this wine and it was very smooth wine. The finish was moderate. But my favorite part was picking up some green pepper at the end. This was top notch wine that is well rounded. A must be in my opinion. We then tasted was their 2007 Cabernet Franc. I really liked this wine. It was a highlight and one that I was eagerly waiting to try. This will not be released for a while but when it is it should be a winner. I will give a further review of this wine later in the week. Pindar was nice enough to let me take this home and try later. Next on the list was a vertical of two reserves Merlot’s. The first was from 2006. This merlot was a bit spice for me. I was getting some black cherry. This was not my kind of wine; I prefer a little more fruit and aromatics in my merlot. Pindar then poured for us their unreleased 2007 Reserve Merlot. I can sum this up in one 3 letter word. WOW! Lots of big fruits. Was getting loads of cherry and Raspberry and blackberry. I was also picking up some floral, rose petal nose. Really digging this. The taste was even better, silky smooth in the mouth with a touch of tobacco. The fruit was still there and going strong. The finish was long and had a nice earthy soft spice finish. I am not sure what the retail price of this wine will be, but whatever it is, make sure you pick it up. Les then wanted me to try their non vintage Pythagoras. This is a Bordeaux style wine. It is a blend of Cabernet Franc, Merlot, Petite Verdot and Malbec. It sells for $12.99 in the tasting room, but let me tell you it tastes like $30. This is a very soft and supple wine. It has lots of flavor, loads of berries and a wonderful balance. There is enough acidity to make this a great wine with food and the tannins are just perfect, very soft. My wife and I loved this wine and hours later were still talking about it. The next time you are out at Pindar, or you see it in your local wine shop, pick up some. You will not be disappointed. 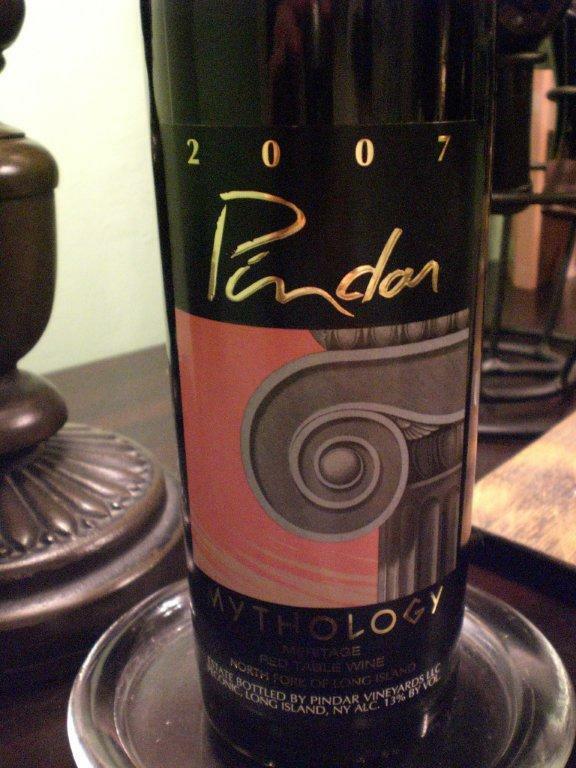 Following Pythagoras, we then tasted their top of the line red, Pindar Vineyards 2007 Mythology. They don’t make Mythology every year. Their current release in the tasting room is their 2001 vintage. But this was extra special. From an extra special year, this is an extra special wine. Like Pythagoras, this is a blended wine, but this Mythology is a blend of the best of that year. This is a blend of Cabernet Sauvignon (42%), Cabernet Franc (27%), Merlot (18%), Petite Verdot (8%) and Malbec (5%). And let me tell you, this was one might blend. This could be my favorite of all the 2007 blends that I have tasted to this point. In the glass I was getting all berries all the time. Big and juicy and ripe. There were some wonderful Blackberries, Raspberries, and Back Cherries. I was getting some Plum and chocolate. There was a hint of some bell pepper which was subtle, but nonetheless, enjoyable. There was this wonderful floral element that lingered long after I took my nose out of the glass. I honestly could say that I could dive into this glass and go for a swim. The taste was even better. Everything that I was experiencing on my nose with this wine was coming on full steam ahead in my mouth. There was this wonderful spicy earthy element that really tasted amazing. I was getting some mint and basil as well, not dried and harsh, fresh and green. There was a touch of fresh roasted coffee and rich dark chocolate. This wine had great balance and really soft and attractive tannins. I am not sure when this will be released or what the price of it will be, but I can tell you this, when it come out, there may not be enough on the shelves for long. I plan on picking up alot more of this…you should too! We ended the day in the tasting room with Pindar and Les with a glass of Pindar Vineyards 2008 Late harvest Riesling. Les explained to me that this wine along with the 2008’s were his first wines at Pindar that he had his hands in from start to finish. When he arrived the 2007’s were harvested and in barrels. 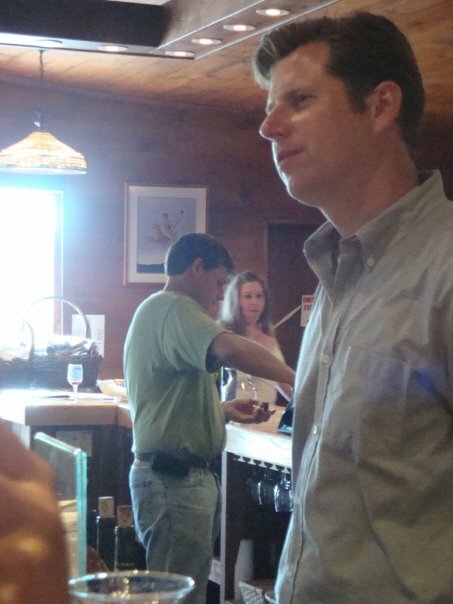 He had a hand in the blending of the 2007 reds, but his hands were all over the 2008’s. This Late harvest Riesling had a wonderful nose. Full of apricots, and tropical aromas. I was picking up some pineapple and a little lime. The taste was even better. The apricots carried over with a hint of some nutty spice and a touch of honey. This was a very well balanced wine. The acidity and the sugar were in perfect balance, and honestly, neither one was overpowering. They worked hand in and to make this one of the best desert wines I have had on Long Island. Following our world wind day of tasting, my wife and I were starving, and we were going to go grab a bite to eat. From the looks of things, Les and Pindar were hungry as well. Pindar offered to treat us to lunch, so Les and Pindar led us to a local place in New Suffolk, where Les grew up as a kid. We had a great lunch and great conversation at Legends on First Street. It was great getting to connect and chat with Pindar, it was awesome to listen to Les talking about his early childhood growing up in New Suffolk but it was even better to to hang out with a couple of guys who truly love what they do; make wine for people who enjoy wine. Melissa and I shared stories about our lives growing up and how we came to be. We talked about our wedding last year. And we during the conversation, we come to find out that Pindar and his wife Nicole and Melissa and I were married on the same day last year, during hurricane Hanna and Ike. Small world. Les and Pindar working together in the vineyard and winery is a wonderful thing to see and hear. These are two soft spoken friends with deep passion to bring the wine they create to the tables of Long Island. You can see the passion they have and you can taste it in the wines they are making together. This was also a wonderful experince for me, because I was able to hang out with two very cool and down to earth winemakers. 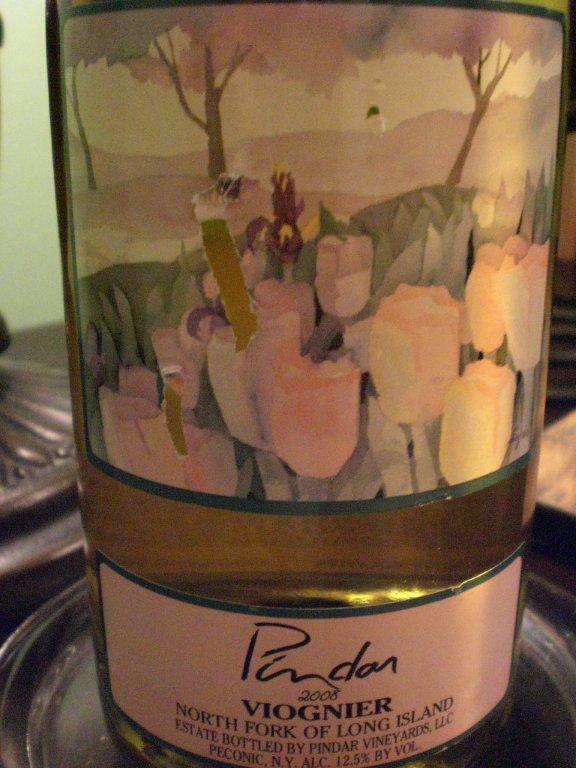 I was able to see what Pindar Vineyards is all about, and I can tell you, they are not just about Winter White. They are about bringing the wine of Long Island to the people that love wine, and they are about opening up peoples minds about wine and expanding their palate. My palate and was expanded on this day, by one of the biggest vineyards on Long Island and by to of the nicest people I have met in my early months of wine blogging. Thank you to Pindar, Les and the staff at Pindar Vineyards. Thank you to Dr. Dan. Thank you for striving to make wonderful wine for all to enjoy. Thank you for allowing my wife and I to start a relationship 7 years ago there. Thank you for welcoming me in to your vineyard. You made me feel so welcome. Thank you for giving me the opportunity for the visit with you, but more importantly, the ability to build a relationship. 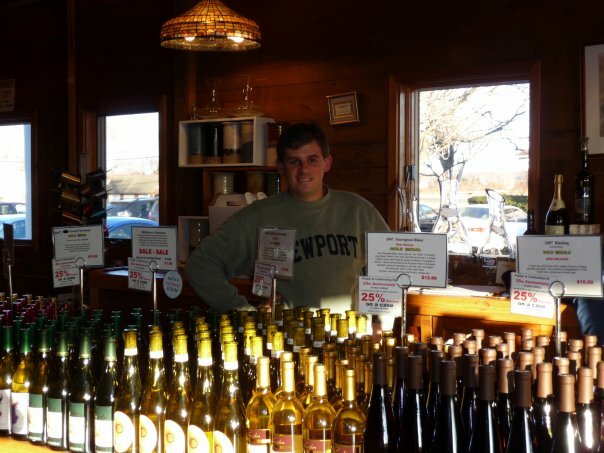 This entry was posted in Long Island, Pindar, Winery Visit. Bookmark the permalink. Thank you so much for your support. It was a joy for everyone to have you out at the winery. We are very much excited about our business, our wines, and our customers. It means the world to us that you did take the time to get to know us a little bit more. We love your blog! We’ll continue to follow your pieces, as you’re doing an excellent job. We are strong supporters of the region, and firm believers in making sure that the right type of focus is placed on the wines. We are looking to build more and more of a connection with our community of fans, and we continue to make great wines that people enjoy. We applaud you for your efforts – until next time! We’ll make a toast to you on our anniversary :-)! Thank You so much for the kid words. I had a very nice time with Pindar and Les. I look forward to the next opportunity, which may be at Champagne, Chopin and Caviar. But if not, a toast to our Anniversary is definitely in order! Pythagoras is one of my favorite wines ever. Finally a reasonably priced Bordeaux-type blend from Long Island! Nice writeup. Did you taste the rest of their portfolio? Pretty god awful really. Mommy: There are plenty of affordable reds on Long Island. Just need to find them, which admittedly can be hard. Thanks for posting. I only sampled a portion of the wine they produced. It is very difficult to find a vineyard where one loves every single wine that vineyard produces. I have had my share of bad wines. And we all taste differently. The important thing is to get into wine and find your niche, and make sure it is local. I can remember when I first started drinking wine, It used to be something from a box or some cheap Pinot Grigio. But I expanded my palate and now like all types of wine, that is the natural progression and the fun about wine. 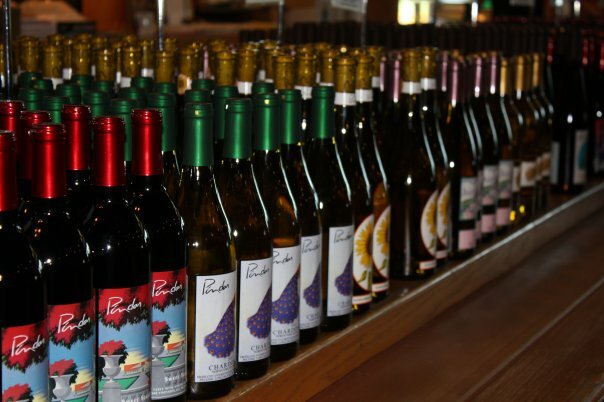 When visiting Long Island with friends each summer, I make a point to stop into Pindar and Martha Clara wineries. I adore the Hamptons White table wine at Pindar; it’s a perfect summertime classic. And in addition to the wine tasting, the festivities at Martha Clara are always fun, especially for the children.